bLuGrn Updates: AUGUST SHOWS starts SUNDAY! Come help us kick off the new season and meet us this Sunday (August 1) in Annapolis, MD. Members of the DC Craft Mafia will be selling our crafty goods on West St.
DCCAH has teamed up with the Walter E. Washington Convention Center to host Arts On N, a two-week arts festival along N Street between 7th & 9th Streets, NW. The Festival features art by local artists, music, fashion and local businesses. 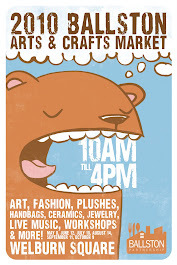 A monthly juried outdoor market for the exhibition and sale of original handmade art-and-craft items.